Discover How to Heal Your Meniscus Tear With Exercise Instead of Painful – & Often Costly – Surgery! If you or a loved one has suffered a meniscus tear, this is going to be one of the most important web pages you ever read. Here’s why – a recent study published in the prestigious New England Journal of Medicine shows that after one year there is no significant difference between repairing a meniscus tear through surgery and repairing one through physical therapy (exercise). It’s true! Plus, there’s this – the average recovery time after meniscus tear surgery is over three (often painful) months while the average recovery time for exercise is also just three months! So I took it upon myself to get the right knowledge, scour medical research, and do hands-on testing, so I could ACTUALLY help my clients get better. 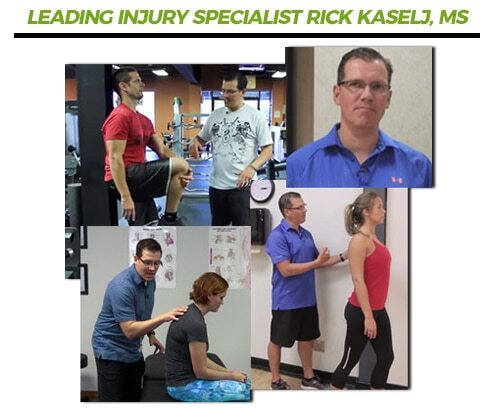 My Meniscus Tear Program is the result of 6 years of University study (including a Master’s Degree in Exercise Science), over 20 years of hands-on experience, constant searching for the best meniscus tear recovery techniques, and teaching these techniques to thousands of other fitness & health professionals who have then used them to help their clients - plus thousands of personal training sessions with injury and meniscus tear clients, and the careful scrutiny of over 22 medical research papers. Now I’m going to tell you all about my Meniscus Tear Program and how it can help you regain pain-free movement without surgery or drugs. But first, let me quickly explain what a meniscus tear is and why it is important to take action to heal a tear. If you have suffered a meniscus tear, you are not alone. In fact, meniscus tears are one of the most common knee injuries. You’ve probably heard of athletes, particularly those in contact sports, suffering meniscus tears but truthfully anyone can tear a meniscus. Common causes of a meniscus tear can include banging a knee, lifting weights and degeneration of the meniscus as we age. Cartilage weakens and wears thin over time; that means it’s possible for older people to tear a meniscus simply getting out of a chair and twisting awkwardly. The sensation of the knee "giving way"
Without proper treatment, a piece of meniscus may come loose and drift into the joint. This can cause your knee to slip, pop, or lock. The truth is, calling surgery for a meniscus tear a “meniscus repair” is a bit of a misnomer. Actually, in 90% of the surgeries, the surgeon simply removes the torn piece of meniscus. This increases the load on the remaining piece of cartilage, which over time can lead to more wear and tear... and even arthritis. That’s why I feel so strongly about healing a meniscus tear naturally with exercise if at all possible. The problem with undergoing an exercise program for meniscus repair is that most fitness and health professionals take a shotgun approach to exercising injuries. They keep giving you more and more exercises, hoping they will help. The problem with this scattershot approach is that often key components of a meniscus tear recovery program can be missed. For example, many fail to include exercises that target the hips and ankles, which are also important for recovering from a meniscus tear. Also, the order of the exercises is very important. Doing the exercises in the right order will increase their effectiveness. The right exercise done in the right sequence can build on each other and produce greater and faster results. I found the least number of exercises that you need to do, in the right order and the correct amount that cover all of the areas that need to be addressed in order to overcome a meniscus tear. To be frank, I would stop all of the other exercises you are doing for your meniscus tear and give this program a go for 7 days. That short period of time is enough for you to see the difference a well-thought out plan like this can make for your meniscus tear. You’ll notice the difference physically almost right away. Get Pain-Free & Enjoy Life! 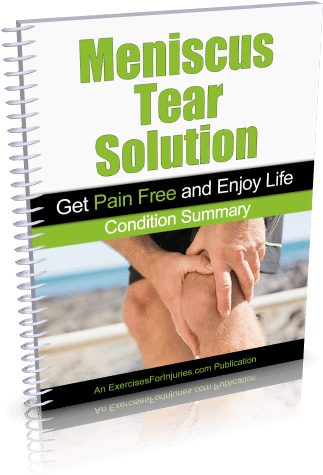 At last, there is a comprehensive yet easy to follow program that contains the exercises you need to know to naturally heal a meniscus tear. You get manuals that describe the entire program in an easy to understand manner and videos that show you exactly how to perform the exercises …and much more. Plus, the program contains an assessment guide so that you can determine if you have a meniscus tear, as well as the severity of your injury, AND a Quick-Start Guide that will show you the fastest way to get started so that you can heal your meniscus as quickly as possible! You get a video, manual and fill-in sheet to help you assess your current condition. The video and manual walk you through how to assess the current condition of your knee. This is important to do because different people experience different levels of pain and stiffness. You'll record your assessment results on the fill-in sheet and based on your findings you’ll know exactly where to start in the Meniscus Tear Solution Program. This assessment process is critical to ensuring you get the best results possible from the program and you avoid injury. The Meniscus Tear Solution is filled with a lot of beneficial information but I want you to be able to get started and experience results as fast as possible, so I created this guide which distills all the content down to the bare essentials you need to know to get started fast. The Quick-Start Cheat Sheet lays out the exact roadmap you need to follow to regain maximum range of motion and pain-free movement in your knee. I’ve broken this program into three stages. The three stages allow you to self-direct your progress so you get the fastest possible recovery. The stages progress from very easy (Stage 1) to more challenging (Stage 3). This three-stage structure ensures that any person can complete this program and improve functionality and unlock maximum range of motion in their knee – even those who have severe pain or who have not exercised a day in their life! Give you everything you need – exactly how many reps and sets you should do, time and intensity, what you should feel as you do the exercises, so you know you’re doing them right. Meniscus Tear Solution is very thorough and doesn’t move at too fast a pace to grasp. I was looking for specifics on how to work with individuals suffering or recovering from a meniscus tear and Meniscus Tear Solution gave me that. I have already recommended this presentation to several friends in the industry! Thanks! Your exercises have changed my life. I had been in constant pain for 15 years. I just wanted to say thank you for providing what I needed to resolve my problem! After following your exercises, I went through work all day with no pain and no pain medication. Yeah! Thanks so much for a simple answer to a problem I have been dealing with for months. Thank you Rick, you saved my career! After playing sports I feel better and the pain is not as intense. I thought I would just have to retire due to the pain, but I now see there is hope with your program it has helped me a lot. Get The Meniscus Tear Solution Today! The Meniscus Tear Solution is filled with the expert tips and exercises that will allow you to repair your meniscus tear and eliminate discomfort and pain as fast as possible. Save yourself money and frustration – get The Meniscus Tear Solution today and restore pain-free range of motion in your injured knee! That’s the decision you face right now. Remember, that recent study showed that after one year there is no significant difference between repairing a meniscus tear through surgery and repairing one through physical therapy (exercise). Also remember, that 9 out of 10 meniscus repair surgeries are actually meniscus removal surgeries where the piece of torn meniscus is cut out, increasing the load on the remaining cartilage and increasing your risk of greater wear and tear and arthritis! Heal your knee safely and naturally with the very best exercises that have ever been created. Get the Meniscus Tear Solution today! For just $37, you could save hundreds and possibly thousands in medical costs. I am so sure that you will love the Meniscus Tear Solution that I am offering an unconditional 100% money-back guarantee. That’s EIGHT FULL WEEKS to put this program to the test! I don’t think I can be any fairer than that. Eliminate pain, improve stability and gain range of motion in your injured knee or get your purchase price back! Get on the Fast Track to Recovery! The materials we’ll be using in the “Meniscus Tear Solution” are DIGITAL, DOWNLOADABLE VIDEOS and PDF documents, so... IMMEDIATELY AFTER YOU ORDER, you will get INSTANT ONLINE ACCESS to the whole program! P.S. Why spend so much money on knee surgery when studies have shown that there is ultimately no difference between the results of physical therapy and knee meniscus surgery? With The Meniscus Tear Solution you get the best exercises arranged in the best possible routine to promote healing and allow you to get pain-free and enjoy life again. Don’t waste time and money, get this powerful program today for a special low price of just $37. Order now. P.P.S. Yes, there are meniscus tear exercises that you can find online. However, these exercises are not a complete program! What you will find on the web is typically information focusing on just one component of a complete Meniscus Tear Exercise Program – most often “strengthening.” There are actually 13 components to repairing a meniscus tear. By doing these incomplete exercises you could be dooming yourself to a lifetime of knee pain and instability – and much higher medical costs later on! Get the complete solution you need to feel better. Order now.